A differential transmits engine power to the wheels by splitting it two ways at the same time allowing the wheels to spin at different speeds. They also acts as a final gear reduction, slowing the rotational speed of the transmission before it hits the wheels. This leads to longer tire and suspension life, more responsive steering and improves gas mileage. 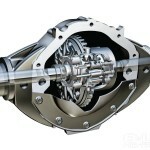 Front wheel drive vehicles differential is located in the transmission, rear wheel drive vehicles differential is external. All Wheel Drive vehicles usually have three differentials, a differential between each set of drive wheels and another differential between the front and the back wheels. Four Wheel Drive vehicles only have two differentials, between each set of drive wheels, the front and back are locked together so that the front and rear wheels have to turn at the same speed. Whether its differential maintenance, differential repair, or a complete differential replacement or rebuild, Advanced Auto Repair is a top choice for differential repair service in North Attleborough. Our experienced mechanics know all the components that make and operate differentials.